It was less than a year ago that I first saw that great American classic The Godfather. I’m not into R-rated movies typically, so I had been avoiding it. But after reading so much about the film and seeing it time and again on lists of The Best Movies Ever Ever Made Ever, I decided to give it a whirl. I found it much less disturbing than I thought I would, which saddened me some since it is incredibly violent; I suppose I’m becoming desensitized. But I also saw what makes that film the classic it has become. In fact, I was so impressed with Brando’s performance that I spoke with his accent for six months, letting my jowls droop and shuffling around the house like the aged man he had become. But I’m a man behind the times. I’m coming to the party thirty years too late. 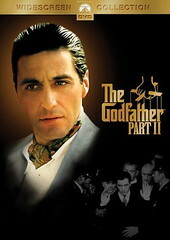 So it was with no sense of urgency that I finally checked out The Godfather Part II. Being an economical fellow I checked it out of the library. It took me about three evenings to watch since finding time for movies can be tough; we only watch them between the time the boys go to bed and our own bedtime, which never seems like enough leisure time. In any event, I enjoyed the sequel immensely but less than the original. Robert DeNiro makes a name for himself as the young Don Corleone in the flashbacks that establish the past of the great Don. All of this backstory comes from the original novel, but Coppola was genius to toss it in here, making The Godfather Part II both a sequel and a prequel. Plus it makes this whole saga all the more tragic to see the humble innocent roots of the man who started all this bloodshed and crime. Al Pacino and Diane Keaton still look like babies. And it was sad to see what Michael Corleone (Pacino) had become: a man haunted by and faithful to the responsibility given him as the Godfather. The evil the family created tears the family apart, and the Pacino character may be the most evilly sympathetic character in film history. And it was fun to see famous scenes — ones I had only heard about or seen snippets of — finally in their entirety. Michael kissing Fredo at the New Year’s party. DeNiro shooting Fenucci. Pacino’s bedroom being riddled with bullets. The finial flashback with all the siblings at the dinner time awaiting the arrival of the Don and then leaving Michael all alone. Classic. Classic. Classic. I’d recommend you go out and rent it immediately, but you’ve probably already seen it.